Shellac Stack No. 142 reminds you that “you can wander anywhere, but you have to go to Italy to roam.” (Ouch!) From the Happiness Boys to Georgia Gibbs; from Bing Crosby to Jerry Colonna; from Joseph Samuels to Jay Wilbur; it’s another 78 rpm variety hour, full of delightfully unexpected musical twists and turns. A small correction for 78 die-hards: When discussing the Supertone label in this episode, I mistakenly conflated it with another Sears & Roebuck label of the same era: Silvertone. Silvertone was pressed at times by Columbia (and Gennett, among many others), but Supertone was — to my knowledge — never pressed by Columbia. 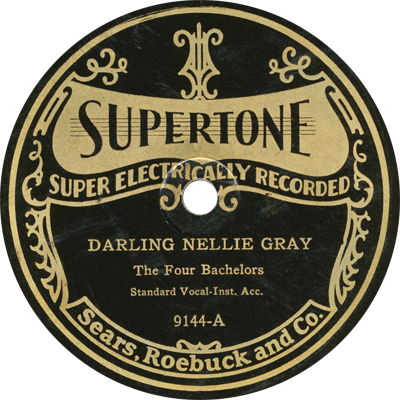 Supertone records were recorded and pressed primarily by Gennett (like the one pictured above), with a few late issues deriving from Brunswick masters. Trivial? Perhaps. But someone might care.